You want a peace of this? In the past few days, there have been a few news stories out there about both the domestic and international versions of The Voice, the singing competition in which four coaches/judges rely on just a contestant’s voice in order to persuade them to turn their chair around and fight to add them onto their team. In the United Kingdom, singers Danny O’Donoghue of The Script and Jessie J are exiting the show, while Ricky Wilson of the Kaiser Chiefs and Kylie Minogue will be their replacements. In the United States, original judges Cee Lo Green and Christina Aguilera are returning to the panel, leaving fill-ins Shakira and Usher out of a chair this season. 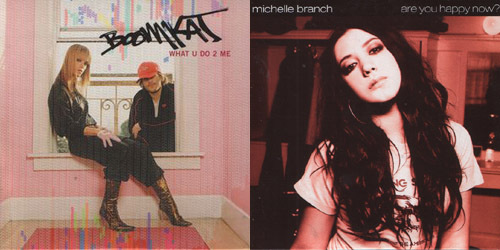 With all that shifting around, I thought I would do the same and compile another top ten list of the acts with the most top 40 singles to make my personal chart who have also coached on the show, whether here in the U.S. or abroad. In fact, 18 of them, both current or former, have managed at least one charting single. Can you guess which of them has the biggest voice of them all, at least on my survey? Check it all out below… but turn your chair around to face your computer, this isn’t a singing competition. Her hips don’t lie and neither do her chart stats. First a star in the Spanish-speaking world, she set her sights on the English market with 2001’s Laundry Service. Her first single to make it on remains her highest peaking release, “Whenever Wherever”. It went to #2 for two weeks. Although she’s had some massive worldwide hits since then, the Columbian singer hasn’t ranked on my top 40 since early 2006. The first season of The Voice of the Philippines is currently underway, and Apl.De.Ap is the only judge from that version to appear on here. He’s one of two members of the Black Eyed Peas on the list, the other being will.i.am further up. The group’s biggest entry to date, 2003’s “Where Is The Love?”, went to #4 for a week and garnered a lot of airplay. The song features Justin Timberlake on the chorus. Madden’s been a judge for two years on Australia’s version of The Voice. As a member of pop-punk quartet Good Charlotte, Madden made my top 40 six times in the past decade or so. One single went to #1, “Lifestyles Of The Rich And Famous”, which spent four weeks there in 2003. Ah, the days of middle school. They last made my chart in the fall of 2010 and are in the process of recording once again. He’s a actor, dancer and a singer and last season, he filled in on the U.S. edition of The Voice. Though he first charted in 2000 with a single that was pulled from radio, his biggest success so far on my chart is “Yeah!”, featuring Lil’ Jon and Ludacris. His signature song rose to #5 in 2004. Usher largely missed my chart after the Confessions era, though he still pops up now and again with a song that I enjoy. Back at #9 was this guy’s partner-in-crime from the Black Eyed Peas; now, will.i.am appears. His only solo single to make my top 40, in which he’s a featured performer, ended up being his lone #1 so far: “Hall Of Fame”, as done by The Script. It occupied the spot for four weeks last year. Since then, he released a solo album, #willpower, but nothing from it has even come remotely close to making my chart. O’Donoghue was on the U.K. edition of The Voice for two seasons before leaving this Spring. He first made the top 40 in the group MyTown, but he is primarily known as the leader of The Script, who have been massive on my chart since 2009. Of their seven charting songs, four went to #1, including “The Man Who Can’t Be Moved” for eight weeks. They’re expected to release a fourth album early next year. The former Menudo singer and Latin heartthrob has been enjoying his time as a judge on The Voice in Australia. His self-titled debut English album broke him in a big way, but it was his followup release, Sound Loaded, that delivered his biggest hit thus far: “She Bangs”. It totaled four weeks at the top in 2000. Martin hasn’t been on since 2001, but a recent single, “Come With Me”, came out earlier this year. She’s a legend and she’ll be bringing the heat to the judging panel on The Voice in the U.K. in 2014 during the show’s third season. Though Minogue’s been hitting the charts since the late 80’s over in Europe, her first single to reach my top 40 was a #1 for five weeks, 2002’s “Can’t Get You Out Of My Head”. 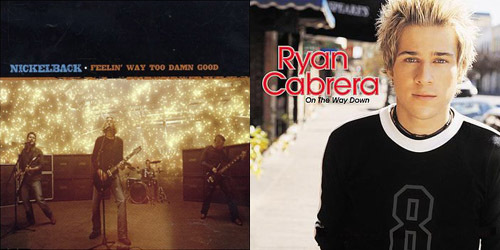 2004’s “Red Blooded Woman” also topped my list for three weeks. The singer last charted earlier this year. He’s been with the U.S. version of The Voice since its beginning, including this upcoming season, but you also know him as the leader of Maroon 5. The band has now been atop my chart six times, including the nine week “This Love” in 2004 and their biggest, 2007’s “Makes Me Wonder”, which spent eleven big weeks there. All in all, they’ve had 17 top 40 entries, one of the largest sums for a band to my chart. She’s got some big pipes and a big stack of hits too, and thus, Christina Aguilera glides into the #1 spot on my list. She had my very first #1 back in September 1999 with “Genie In A Bottle” and would later charge the chart summit with “What A Girl Wants”, “Come On Over Baby (All I Want Is You)”, “Lady Marmalade” (with Lil’ Kim, Mya and Pink), “Beautiful” and “Moves Like Jagger” (with Maroon 5). 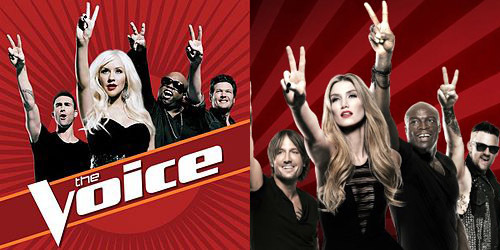 Don’t forget to tune into the premiere of the U.S. version of The Voice, premiering this Monday night at 8PM EDT/7PM CDT on NBC, and follow the blog or click “Get Social!” to find PGTC on social media.